Please note that the content of this book primarily consists of articles available from Wikipedia or other free sources online. 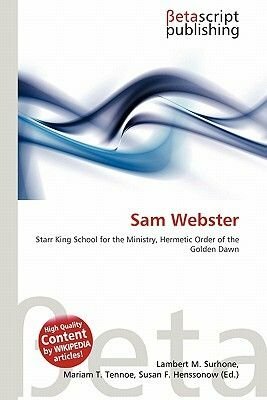 Sam Webster is a writer, Thelemite, a member of the Golden Dawn tradition, and Bishop Tau Ty of Ecclesia Gnostica Universalis, as well as an initiate of Wicca. Webster holds a Master of Divinity degree from the Starr King School for the Ministry at the Graduate Theological Union in Berkeley, California. He is notable as one of the pioneers of open source religion - the use of the open source paradigm in the field of spirituality. He has authored a number of articles and essays on occult and Neopagan topics, publishing both online and in periodicals such as Green Egg, Mezlim, Gnosis and PanGaea. Many of his essays on Pagan Dharma and Thelema have also been made available online. In 2001, he was one of a number of Neopagans interviewed in Modern Pagans - An Investigation of Contemporary Pagan Ritual, a feature article in the counter-cultural journal RE/Search.